The 2020 news this week may have looked good for President Donald Trump. The potential independent candidacy of former Starbucks CEO Howard Schultz has dominated discussion, along with assumptions that such a run could throw the election Trump's way. And one of the president's biggest potential GOP rivals, former Sen. Jeff Flake, announced he will not run. Still, even as national Republicans seek to close ranks behind the president, seeds of potential primary challenges were planted. There was buzz around Maryland Gov. Larry Hogan, a moderate who's also one of the most popular governors in the country, as a potential GOP primary entrant. Former Massachusetts Gov. Bill Weld was reported to be considering a candidacy as well. Such moves would at least open up for discussion the prospect of a Republican challenge to Trump. The ABC News/Washington Post poll released this week found a third of Republicans and Republican-leaning independents opposed to Trump's nomination for a second term. A week in which the president's top intelligence advisers openly contradicted him -- and the president attacked them, then brought them close again -- is unlikely to help on that front. Trump still controls his Republican Party. But the first month of 2019 has put his vulnerabilities into the party's consciousness anew. Once again the country saw a president on an island this week. While teams of congressional leaders vocalized a consistent determination to reach a bipartisan deal over border security funding, the president was tweeting a range of disinterest, disapproval and skepticism in the legislative process. President Donald Trump speaks during a meeting with Chinese Vice Premier Liu He, in the Oval Office at the White House, Jan. 31, 2019. "Republicans on the Homeland Security Committee are wasting their time," the president tweeted Thursday. 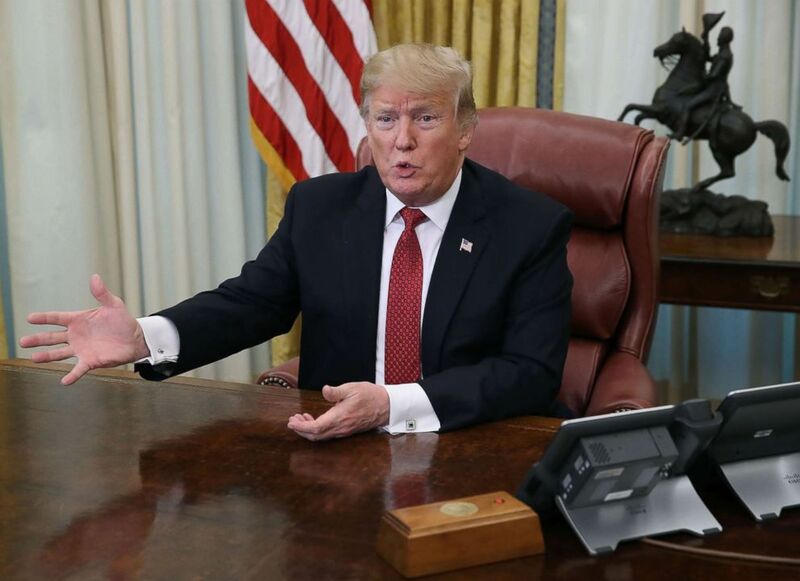 "Democrats, despite all of the evidence, proof and Caravans coming, are not going to give money to build the DESPERATELY needed WALL. I've got you covered. Wall is already being built, I don't expect much help!" On foreign policy and global threats, the president put himself at odds with his own government intelligence leaders again. At one point, he seemed to question their fitness for the job altogether. "Perhaps Intelligence should go back to school!" he tweeted. Bringing it full circle, the president's rebuke of intelligence assessments only led to further isolation too, as Republican leaders on Capitol Hill grew more frustrated with the White House and felt the need to condemn the Commander in Chief. The 2020 Democratic field is growing, as does the challenge for candidates jockeying for position to get their message through to voters who are just tuning into the process. 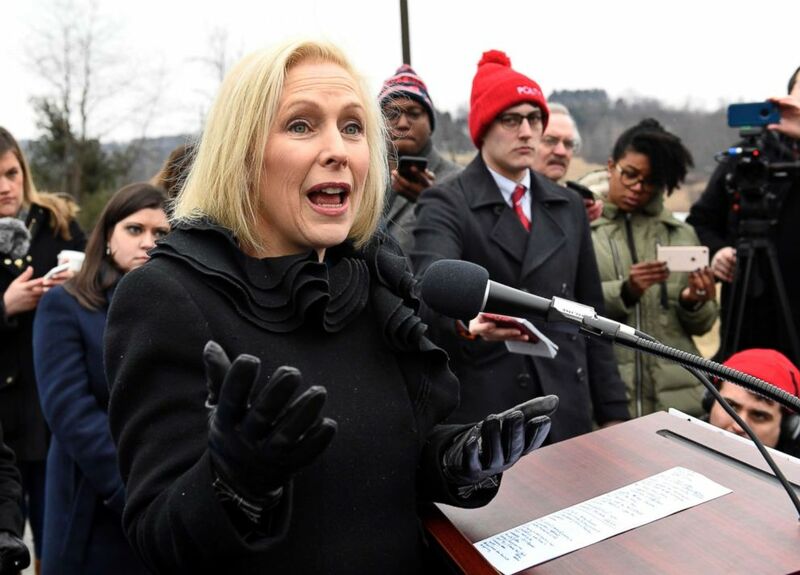 Sen. Kirsten Gillibrand, D-N.Y., whose announcement just over two weeks ago now feels like two years ago, is making her first campaign trip to the first-in-the-nation primary state of New Hampshire. It's a chance to make an initial impression on a state that could make or break her candidacy. While Gillibrand and other early entrants into the race, like her colleague Sen. Elizabeth Warren, still will have the opportunity to formally launch campaigns, Sen. Kamala Harris' effective rollout shows that how you start could determine how you finish. President Donald Trump participates in a meeting about human trafficking on the southern border at 11:45 a.m. At 12:30 p.m., he has lunch with Secretary of State Mike Pompeo. Then he and first lady Melania Trump are scheduled to travel to Palm Beach, Florida. U.S. Secretary of State Mike Pompeo holds a briefing at 8:30 a.m. in Washington. Roger Stone, a veteran political operative and longtime friend of the president, appears in district court for his arraignment at 2 p.m. in Washington. Sen. Kirsten Gillibrand, D-N.Y., meets with voters in Manchester, New Hampshire, during her first trip to the state as a presidential candidate. Sen. Sherrod Brown, D-Ohio, has several events in Iowa: At 8:30 a.m. CST, he participates in a roundtable with the Clear Lake Chamber of Commerce; at 12:45 p.m. he hosts a roundtable with local farmers in Perry; at 4 p.m. he tours TechWorks in Waterloo; at 6 p.m. he holds a meet-and-greet in Waterloo. Andrew Yang, entrepreneur and founder of Venture for America, speaks at a Woodbury County Democratic Party fundraiser at 7 p.m. CST in Sioux City, Iowa. Howard Schultz, former Starbucks CEO and author of "From The Ground Up: A Journey To Reimagine The Promise Of America," holds a book tour event at 7 p.m. PST in San Francisco.